HAND PAINTED, WITH PATTERN NO. 4219 DATING TO PRE-WAR 1936 - 1939. CARLTON WARE vintage 6 small green Australian design Tea /petit four Plates - 4"
Australian design. Green with fruit in corners and raised pattern. Small size. SEAMLESS TINY NIBBLE STUDY LAST PICTURE. THIS IS A LOVELY SET BY CARLTON WARE, LOBSTER SALAD BOWL & SERVERS. CARLTON WARE LOBSTER BOWL WITH SERVERS. LOBSTER FEET ~ THE SERVERS WITH' LOBSTER CLAW' HANDLES. WHERE THE LOBSTER 'FEET ' TOUCH GROUND. Base has Carlton Ware stamp plus Impressed Number--2185. CARLTON WARE GREEN LEAF DISH with RED CRAB to Centre--Pale Green Colourway with Dish having Lettuce Ribbed Pattern and Raised Bright Red Crab. 4 cms tall. A lovely item dated from the 1920s, does have a little crazing on the bottom of the dish, hence low starting price. Carlton Ware Crinoline Lady Napkin Ring. Base has Carlton Ware stamp plus Impressed Number--2185. CARLTON WARE GREEN LEAF DISH with RED CRAB to Centre--Pale Green Colourway with Dish having Lettuce Ribbed Pattern and Raised Bright Red Crab. Size--------30 x 19 cms across. Base has Blue Carlton Ware stamp and Numbers 027/8296 plus 4219. Back has circular raised rim which has three original holes in order for hanging to be secured--cord hanging attached. Good condition with fine crazing; looks as though has been hung on wall most of its life. This is a superbly hand decorated and gilded little green lustre coffee cup and saucer from Carlton Ware in the Mikado pattern dating from the 1920/30 period. It is clearly marked with the Carlton Ware backstamp used 1926 -1987 and the impressed number 2707 (patterns introduced in 1968). Height of pot to top of lid: 4" (10.5 cm). 2 x CARLTON WARE GREEN leaf APPLE BLOSSOM BOWLS. large bowl good condition, small marks inside. Smaller size approx 2" tall 11"x 7" width. CARLTON WARE RARE LIDDED POT WITH PIXIE LIKE SNAIL ON LID IIN GREEN H 8"
A leaf type moulded design tomato dish. Green in colour with tomato and leaf design. Impressed into the underside is the number 3. New listingCarlton Ware Salad Bowl - 1920's Art Deco Bowl, plate and one server. Salad bowl 22 cm diameter and 8 cm high. Plate 19 cm diameter. The one remaining server has small chips on the end of the handle as shown in the last picture. The server is 21 cm long. Carlton Ware Majolica Cabbage Leaf Tomato design bowl. Dia: 24 cm; H: 7 cm. IN GENERALLY GOOD CONDITION - A BIT OF CRAZING INSIDE. Large green cabbage leaf bowl. 24 cm long. Lovely 1960's?. style china elongated dish in sage green by Carlton Ware dated between 1926-1987. Two tone design in nice clean lines similar to 1960'70's pieces in a sage green top and off white underside. Vintage Carlton Ware Foxglove Toast Rack Australian Design Leaf Green. Lovely Toast Rack by Carlton Ware Australian Design in the Foxglove Pattern. Measures 10.5cm x 6cm x 8cm. Good condition, no chips or cracks, just tiny bit of crazing See photos for more details. A leat shaped dish. Green in colour with pink floral and leaf design 1650. One side of the mug has a Scottish gentleman in a kilt with sporran and tam o' shanter in relief. The other side has a thistle and the words "Haste ye back". I believe it is quite rare. The base has an impressed number 2535 and the printed words - Carlton Ware Handpainted Made. A Carlton Ware Australian pattern Stand. Circa 1926 . Made circa 1930 by Carltonware in England. It comprises a covered dish and a saucer. 14.5 x 10 x 6cm. 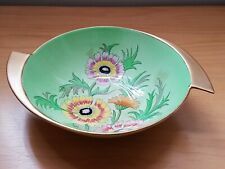 A VERY STYLISH HAND PAINTED CARLTON WARE TRAY IN GREEN WITH BLACK RIM AND GILDED HIGHLIGHTS. DISPLAYS WELL, VERY STYLISH ! CARLTON WARE GREEN WINDSWEPT TEAPOT---------Cream colourway decorated with the Carlton Ware Handpainted Windswept pattern in GREEN. Base has Carlton Ware Handpainted Australian Design stamp in Brown. CARLTON WARE LARGE LEAF DISH / BOWL IN A GREEN AND FAWN COLOUR SMALL TWIG SHAPED HANDLE. Base has Carlton Ware stamp plus Impressed Number---2316. CARLTON WARE OVAL BOWL in GREEN HAZEL NUT pattern having Pale Green Colourways and Raised Hazel Nut & Leaves to one side and Painted Small Brown Leaf to the other--in the shape of a deep oval leaf having lip to one corner. Lovely Toast Rack by Carlton Ware Australian Design in the Foxglove Pattern. Quite rare to find in this size at 36 cm long and 21 cm at widest and 14 cm at smallest. No chips or cracks. There are 2 marks to edge which are from firing process Has crazing as per pics. Carlton Ware was a pottery manufacturer based in Stoke-on-Trent. Carlton Ware Convolvulus or Morning Glory range was Introduced around 1958 and was only in production until 1961. Not many of these designs, particularly these shapes, are in existence. A bowl, leaf type moulded design. Green in colour with floral and leaf design. Impressed into the underside are the nimbers 2116A. A pear shaped fruit bowl, rope work style handle and rope and basket work moulded design. Green in colour with yellow handle and floral and leaf design. 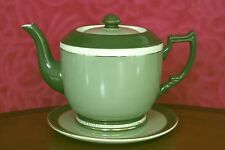 CARLTON WARE WINDSWEPT PRESERVE /JAM POT with SAUCER and LID in their GREEN colourway. Has Carlton Ware Brown Handpainted stamp to base. Size-------------------------------------10 cms tall at pot finial.